DrunkenWasps.com - How to catch a Tiger with this Tale !! Its derby time!...well it is…..isn’t it? Whether you accept this premise, or whether you believe the only derby that Leicester has is with Northampton is probably down to your individual team colours or personal persuasions. What cannot be denied though is that this is a battle between two giants of the rugby union game, and also two of the most successful in the professional era with 12 titles between them, although Leicester currently have the Lions - or should it be Tigers – share with 8 premiership trophies adorning their trophy cabinet whereas ours encloses 4. Yes Saracens have been current Kings of the hill for the last few seasons, but dynasties rise and fall, and the castle is rental only, no club holds the mortgage, and once you are sat upon the throne of champions rest assured the premierships population will be clamouring at the gates to scale the walls and claim English rugby’s crown for themselves, let them eat cake indeed! It has been 5 years since Leicester sat atop of the pile, however since their forced abdication their campaigns have seen them fall short at the portcullis, where other, stronger suiters have dashed their hopes. Indeed last season they had to deal with the agony of also rans, something that Wasps can identify with, as for us our wait for rulership now extends to 10 long years. We went from Rugby royalty to near eviction from the township, indeed the city gates very nearly closed on us for good if it were not for Lord Young and his squire Varndell. Things however have improved for us since then, we have gone from rented 2 up 2 down accommodation to a rather resplendent mansion, our clan has grown, and our colours remain raised, how glorious to see them atop the battlements again, we nearly overwhelmed the ruling power 2 years past, if not for some pretentious tomahawk choppers from the darkness of the west country. Rather than a black and gold crown and sceptre we had to witness chieftains in Headdresses with bow and arrow. So where does this leave us for this weekend? Let us be honest, we are both young pretenders at present, the debt makers have Saracens and Chiefs jousting for the title this campaign, but you never know when young pretenders become Knights, and Wasps and Leicester both have this in their sights. 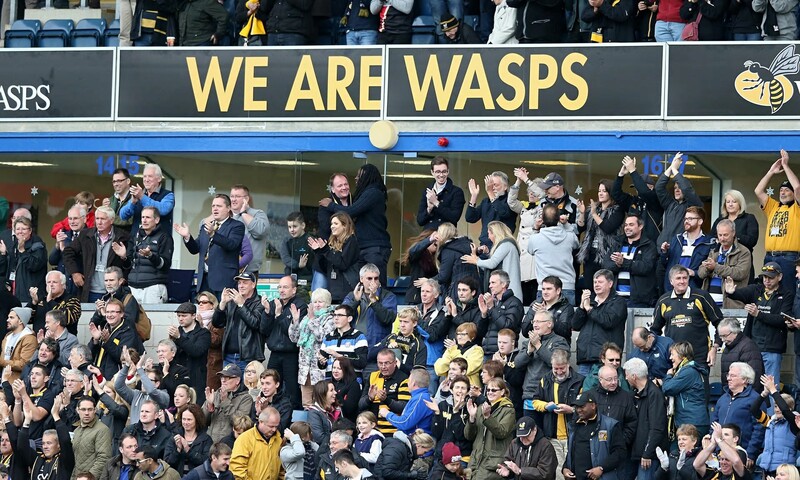 War is hell, and of the 45 engagements that have occurred in the professional era between these two foes Wasps can claim 19 wins whilst Tigers hold the bragging rights 24 times, with two occasions where come sunset both sides have left the field of battle with honours even. More recently the previous 10 coming togethers have resulted in 5 wins apiece, closer inspection though shows that when we have home field advantage the East Midland marauders have left vanquished 4 times out of 5, an 80% win record in our favour, with 13 tries and 133 points gained to 9 tries and 103 points surrendered, a success rate that is kindly reading for those adorning black and gold and more likely to stick in the Tigers claw. Thus we look towards the clash of Coventry 2018/19, the green and pleasant hybrid ground of the Ricoh will once again shudder as battalions meet, swords cross and 2 opposing forces attempt to raise their colours in victory once more, allowing us supporters on the peripheries to return home and tell of fanciful tales of magnificent victory or glorious defeat over many ales in front of the warmth of a pubs fireplace. For Wasps Lord Dai will command his troops, for Leicester the recently promoted Geordan Murphy, his epaulettes may be shiny and new, but don’t let that fool you, this man is quality and Leicester through and through, cut him and he will bleed green! he has gone from squires assistant to captain fantastic onwards to commander in Chief. I imagine the speed at which his previous leader was de horsed after only one engagement and he seated may have been surprising to all to say the least, yet the speed in which he has settled into his mount and took 5 points off the Falcons with a fine 40 minute attacking display last week was impressive! However discipline and defence did look as shaky as a teenager on their first date, did it remind you of anyone? A new neighbour perhaps? One cannot wonder if Dai felt like someone was peering over the training ground fence last week, it certainly looked like Tigers were not so much bullish but waspish in their approach! We ourselves had to be content with a 1 point haul in a battle where it was all there for the taking with only moments to go. Yet if you want to rule the court then your shield must stay strong until the last foray is rebuffed. Neither Wasps nor Tigers can attest to that to date, with both their scalps taken by those from Sandy Park. But what mouth watering individual battles await, De Jong v Eastmond, Daily v Tuilagi, Sopoanga v Ford, Youngs v Robson. And the packs going toe to toe! Bateman, Youngs, Cole, Denton, O’Conner jousting with Launchbury, Brookes, Taylor, Rowlands and Atkinson. It promises to be tight against two teams of heritage and quality. Edited 1 time(s). Last edit at 2018:09:13:21:02:23 by ukms. Re: How to catch a Tiger with this Tale !! A great read Chris .... thanks as always for taking the time ! Love the cartoon. Big test for the Murphy boys. As always I have enjoyed writing this. If anyone has any advice or would like some specific focus when I do the review please let me know. Am hoping for another entertaining tussle on Sunday, hopefully this week with a different result. We may be up against a real tough centre pairing of Eastmond and Tuilagi and Guy may also be appearing so they've got plenty of opportunities to be breaking that gain line with pacy options outwide too. That said, our pack pretty much matched Exeter last week and if as hoped Carr and Hughes can be fit then we will have plenty of our own firepower. For once we might not get bullied by a bigger Leicester pack. Will be interesting to see the team announcement tomorrow. Daly looked great at 15 last week, but Gaby seriously lacked in defense in my opinion, and that won't be good for this week, so perhaps we will see Daly back as centre with Miller. Or maybe even Le Booj making an appearance. Yes very good, looking forward to an entertaining game. I am really glad you are enjoying them as it is why I enjoy writing them. As for the kind comment on it being in the programme....I can but dream! Maybe Quins should pay you to do the same for them.. their forum has been offline for about 5 days now and there must be another club that's dropped off the forum as I can only count 10 in the list? Firstly can I say I think this is probably the best preview of yours that I have read - it is so eloquent and the analogy used is brilliant. My only gripe (and this is me being picky) is that it is titled 'How to catch a tiger...' but you don't talk about how to do it! Love your posts. I look forward to them as well as the game. Excellent preview Wombles, well done and thanks.